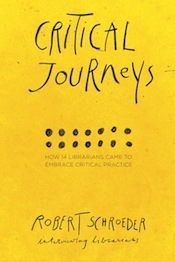 Associate Professor and Education Librarian Bob Schroeder has authored a newly-published book, Critical Journeys: How 14 Librarians Came to Embrace Critical Practice. A growing number of librarians are engaged with critical theories such as critical pedagogy, feminist theory, queer theory, critical race theory, or post-colonialism. Because librarians have backgrounds in all disciplines and inhabit a uniquely central space in our culture, they are combining these theories in unique ways. By remixing ideas from Foucault, Freire, hooks, and Habermas, new and creative practices are emerging. This book includes the story of fourteen librarians and how they each came to be engaged in a critical practice; interviewees include instruction librarians, catalogers, archivists, administrators, and library school professors. The book is available from Library Juice Press.